Is there still a purpose for learning it in today's tech savvy world? Most of the push is that since everything is moving towards being computer-based that we should put a greater emphasis on keyboarding skills, and drop more "antiquated" things like cursive handwriting. The other side of the issue is that cursive handwriting is not useless, as it helps with fine motor skills, and creativity. Additionally, most people's legal signatures are in cursive. Thoughts? WhT are your experiences with learning cursive handwriting? Is there still a purpose for learning it in today's tech savvy world? Most of the push is that since everything is moving towards being computer-based that we should put a greater emphasis on keyboarding skills, and drop more "antiquated" things like cursive handwriting. The other side of the issue is that cursive handwriting is not useless, as it helps with fine motor skills, and creativity. Additionally, most people's legal signatures are in cursive. Thoughts? WhT are your experiences with learning cursive handwriting? Learning cursive handwriting does indeed aid in developing ones hand/eye coordination and may serve as a boon to any who seek to pick up skills such as painting and drawing. Another important reason to learn cursive is so that we may be able to read old documents, such as the United States Constitution and the Bill of Rights. If we do not know our rights, how long might it be before we lose them entirely? Truly , we guys do live now in an era with the rampant rise of technology and modernization but no matter how powerful computers can be, there are its limits and there are things it cannot teach us.All I know is that man invented computer therefore our brain is the one that's really powerful. Long before I have a laptop, it's my dream already either to become a doctor or a novelist. To satiate my love for words and the passion in me to become a novelist someday, I always carry a 90 leaves notebook with me and a pen. I wrote my very own story when I was in the fifth grade, when I was still around 10 years old. I write my stories by dialogue.I always write them in cursive handwriting and when I start to get tired my handwriting slowly switches from cursive to print. I always have good memories when it comes to writing because I grow up that my handwriting being appreciated by my teachers and classmates.Not bragging, I do really have a good handwriting.My teachers and classmates told me that it's unusual for a guy to have good handwriting when almost all of the boys in our class have chicken scratches.Also, some girls were the worst. I can't barely read them. ^^ Yet, these are wonderful memories of my high school life. When I entered high school, my essays were appreciated and I am always a part of poem-making competitions. My works were even featured on the daily bulletin of our school. Our school always reminds us to use cursive at all times. Unfortunately, I stopped writing essays when I entered college but during exams where there are essay parts, I always am happy because I always get perfect on essays.At least, the ability's still there.Essays always help me improve my scores. Not only does it develop fine motor skills, but it also serves other purposes that are often not thought of. Take for instance reading original government documents, documents that can be edited to serve other purposes in a digital format with the public knowing none the better because they can not read it. Reading the writings of those who came before us, such as family, friends,and historical figures. Without access to this knowledge from its original source it would be easy for it to be revised and the original meanings skewed leading to a loss of knowledge. I see dropping cursive from education as a way to limit knowledge of history from its original sources, opening the way for revisionist history to be permeated into society. @ ravecorps9 : I cannot agree more! So true. If they are going to drop cursive handwriting, it will be tempting to some to tamper legal documents especially those that are really important. It will even cause chaos and struggle to certain countries. there are other things that can be dropped in school to make up for the usage of computer related things, and there are electives. dropping cursive handwriting would be a stupid move on the government's side, but the way they are sliding these days I would see them doing it. as hoo suggested can't read important papers, guess what, if you want to keep them in line and indoctrinated... over all, there could be less study hall and more room for computer related things, etc. just because there are computers, not everyone is going there and others are going out. and what of those fonts that are cursive in nature? it's like a language, it could be dying but I see it as useful now as it has been any other time. I rather like using it myself, even if there was trouble with the teacher at the time who was trying to teach me. it's not a motor skill, it's just something useful to know and use, in my opinion. To me, a kid not being taught how to write in cursive is truly unusual. Back in grade school, there was (not sure about the current system) heavy emphasis on good handwriting and a significant part of the lesson was teaching us to almost "draw" the words. I find it helps a bit with motor skills, as you say, and even with drawing, a little bit. In my opinion, handwriting is personal; aside from certain recognizable patterns, every person's handwriting has its "quirks". I feel that writing solely in print may tone down these details that are unique to everyone. I can't imagine taking notes in print. Tried it once and it took so long to write that I gave up and went back to cursive. My handwriting's far from beautiful, but it's not bad either and it gets the job done. If I have to take notes, cursive writing always takes less than typing, for some reason. And it's always nice to look at old notes and see how it's evolved! True! We'd sometimes get the slides to review at home, but not always - so we had to be quick and pay attention to both writing down notes AND the presentation itself. I had a classmate who complained her handwriting was horrible (it was bad, but not [i]that[/i] bad); she used to go home and type all her notes every day XD So she was effectively using both handwriting and print (typing) <- crappy joke. Borrowing notes from others is an issue on its own, since it takes quite some time to determine who takes notes in the best way. Some may not write down everything or they might have personal memorization schemes and abbreviations that look completely weird to an "outsider"! Back in high school Anatomy class, the teacher used to scold students who "wrote too much" (i.e. in sentences); she wanted everything written down extremely schematically, which also meant there was little way of figuring out the notes when re-reading them, lol. True! We'd sometimes get the slides to review at home, but not always - so we had to be quick and pay attention to both writing down notes AND the presentation itself. I had a classmate who complained her handwriting was horrible (it was bad, but not that bad); she used to go home and type all her notes every day XD So she was effectively using both handwriting and print (typing) <- crappy joke. Borrowing notes from others is an issue on its own, since it takes quite some time to determine who takes notes in the best way. Some may not write down everything or they might have personal memorization schemes and abbreviations that look completely weird to an "outsider"! Back in high school Anatomy class, the teacher used to scold students who "wrote too much" (i.e. in sentences); she wanted everything written down extremely schematically, which also meant there was little way of figuring out the notes when re-reading them, lol. @pandemonium91: Yes. Sometimes we even resort into capturing a picture for every slide or worst what's written on the board. You friend is quite a diligent one. Yes, I also hate those abbreviations my classmates invent even they are not on the dictionary. I really am a favorite victim of that personal memorization schemes because when the teacher's already handling the quiz, some items will be included in the quiz that are not present in the notebook being borrowed.Then I'll just end up saying to myself, this is not what's on the notebook while some of my classmates are already writing their answers.Arrggh! I am just so pissed off. @pandemonium91: Yes. Sometimes we even resort into capturing a picture for every slide or worst what's written on the board. You friend is quite a diligent one. Yes, I also hate those abbreviations my classmates invent even they are not on the dictionary. I really am a favorite victim of that personal memorization schemes because when the teacher's already handling the quiz, some items will be included in the quiz that are not present in the notebook being borrowed.Then I'll just end up saying to myself, this is not what's on the notebook while some of my classmates are already writing their answers.Arrggh! I am just so pissed off. Well, remember typography is handmade first, so no cursive knowledge means no more swirly pretty texts for your birthday cards anymore xD tho there's always comic sans... ._. Well I personally say it is good to still learn it since we still have to sign for things and such as that plus what if something happened to the technology then what would people do? I had to learn it in School and I kinda liked it. I think it's really good if you can write like that - it always looks good! Handwriting is still very important for modern jobs. 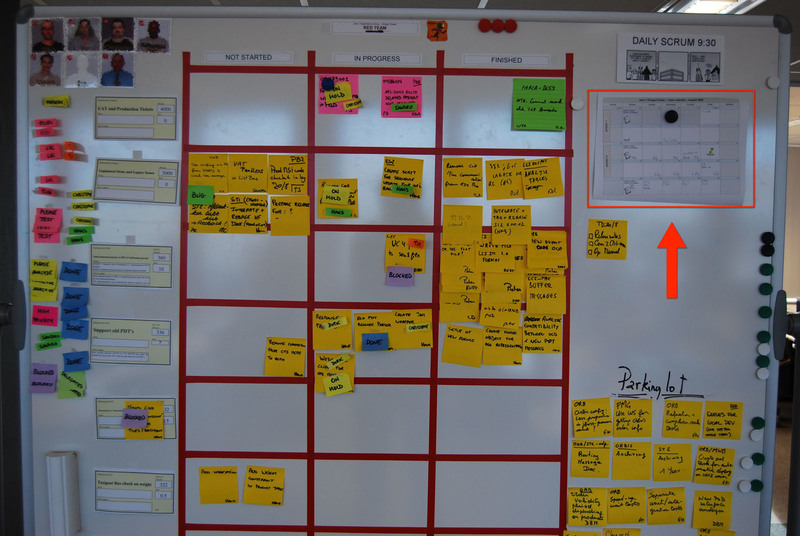 At work we use a task board like the one in the picture below. All the subtasks are written by hand since they are added as you progress the overall bug or story. The advantage of cursive specifically is that is it quicker to write than printing.